The stock market and your portfolio1 grew nicely this quarter, despite fears of possible trade wars, higher interest rates and interim bouts of volatility. A rather noisy ongoing trade dispute with China, the European Union, and even our neighbor and strong ally Canada failed to derail the economy and markets. 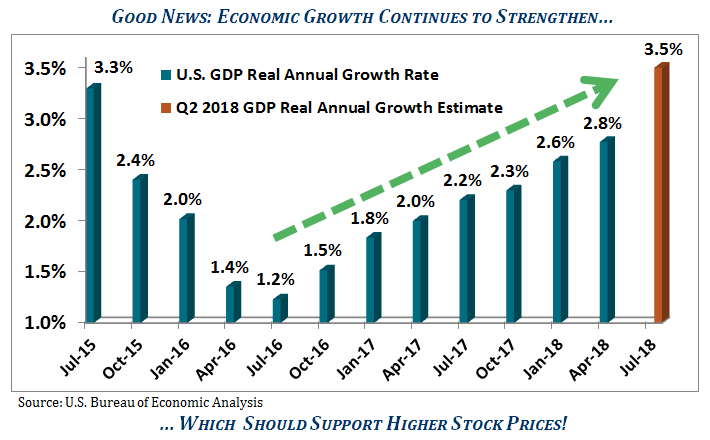 Indeed, the business expansion continues its robust advance: GDP is humming along and the second quarter is expected to reach a new recovery high of 3.5% growth or better. This is great news for working families as the unemployment rate has declined to the lowest level in 49 years! These latest readings add impetus to stronger consumer spending which is two thirds of the economy. As we stated in last quarter’s newsletter during heightened market volatility: “Our best advice: stay positive. It’s likely just a normal correction”! How Will an Expanding Economy Affect Your Portfolio? An improving economy supports a rising stock market. Why? Simply put, a growing economy generates greater corporate sales and profits. The big danger for investors is recessions. Historically, it takes a recession to bring on a major stock market decline of 25% or more. However, our view is that there is no recession in sight for at least the next 12 months. This clears the runway for the stock market to keep advancing. Certainly, the markets will have temporary declines as they have recently experienced, but that is normal. 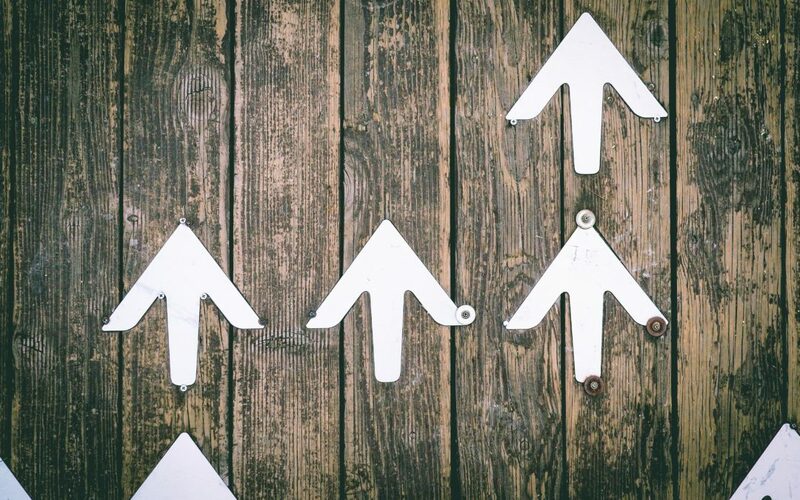 Given the latest robust readings for the economy, our best advice remains: continue to stay positive! Savers have another reason to cheer. A stronger economy brings greater demand to finance the business expansion and higher consumer spending. This increased demand for money also drives interest rates higher. For savers that have been squeezed out of decent interest returns for the past 10 years, rising interest rates are welcome news. Perhaps it is not a giant step forward on cash yields, but you can earn a little more income today from savings balances. By design, your bond investments have laddered maturity dates providing a safe way to capture additional income returns while protecting your principal as interest rates climb. Inflation is starting to kick in, as well. Historically there have been specific investment sectors that tend to do well with a rising inflation environment such as energy, materials and natural resources. These investment themes are well represented in your high quality portfolio, enhancing the potential for higher returns as the cycle progresses. Today’s economy and stock market are following the sequence of a typical business cycle. We will always be looking ahead for evidence of turning points that will cause us to shift emphasis from wealth building tactics and toward a more defensive position for your portfolio assets. Notwithstanding the current headline fears, it is our judgement that trade issues will not derail the U.S. economy from its strong growth trajectory. So, in the meantime, continue to stay positive and simply enjoy this wealth-building phase of the business cycle. Thank you for your trust and the opportunity to serve you. As always, please feel free to contact us should you have any questions or if your financial circumstances should change. A 50 Year Milestone for Joe! In July, 1968, a 25 year old idealistic soul began a six month training program to become a licensed stock broker. His passion was to take his “natural financial-genius gift” to make a career helping other people navigate financial markets. He was immediately humbled as he learned Wall Street lesson #1 – Never confuse ‘financial genius’ with a bull market. He then quickly learned lesson #2 – Wall Street is designed to separate you from your money. Eighteen thousand two hundred fifty lessons later this one-time ex-financial genius still enjoys the everyday challenges of lesson #2 to protect and grow conservative clients’ valuable assets. Congratulations, Joe, on 50 years of serving folks on Main Street! We look forward to many more years of your contribution to the firm and clients! Congratulations (once again) to Genna and Jim! We are most happy and proud to announce a new addition to the family as Genna and Jim welcomed a new baby boy into the world. Patrick James Kopas was born on June 26th, weighing in at 8lbs. 3 oz.—mom, dad, sisters (Kate – 4 & Charlotte – 2), and baby are all doing beautifully! Please join us in celebrating the newest financial advisor (in training). 1 – *Returns are based on the “Pring Turner Conservative Growth & Income Composite.” Your returns could vary from the composite.